NOVA-F is a rectangular non-transparent aluminium grille with fixed blades and a galvanized steel box. It is adequate for usage in such premises that require a higher emphasis on appearance and is designed for the extracted air filtration. 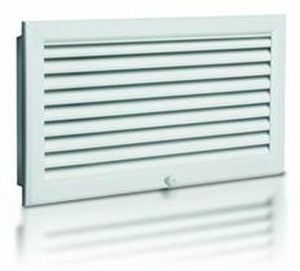 The NOVA-F grille can be mounted directly onto a rectangular duct or onto a wall using the screws in the steel box openings. The grille is fixed to the box with hinges and can be safely closed using a turning knob, or it is possible to screw the grille directly onto the steel box. For a ceiling installation it is recommended to use countersunk screws (type "1" mounting). The NOVA-F grille is manufactured from aluminium profiles with eloxal coating or, if appropriate, a powderlacquered (RAL 9010 - white) surface finish; other RAL types are available upon request. The box is manufactured from galvanized steel and equipped with a mesh screen. There is a free area for a filter inside the box. The grille’s blades are fixed with an axial pitch 20 mm, inclined downwards in a 45°angle.